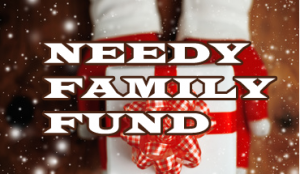 SUNBURY – This year’s Needy Family Fund is now above $15,000, thanks to four recent contributions. Verdilla United Church of Christ of Selinsgrove donated $100, Tammy Pick of Beaver Springs donated $20, the Gates family of Selinsgrove donated $500, and Sabra Karr of Lewisburg donated $25.00. That brings the grand total to $15,088.13. Since 1987, The Needy Family Fund, sponsored by The Daily Item, Sunbury Broadcasting Corp. and BB&T Bank, along with the Degenstein Foundations, has raised more than $2.8 million during the holidays to assist the Valley’s less fortunate. It is administered by Salvation Army citadels in Milton and Sunbury. This year’s goal is $100,000. People can make checks payable to The Daily Item Fund for Needy Families and mail or drop them off to program co-sponsor BB&T Bank, 1104 N. Fourth St Sunbury, PA 17801. Donors can also visit any local BB&T branch where they will process the deposited donation, mail a check to the 1104 N. Fourth St. branch or donate online at https://app.mobilecause.com/vf/Family2017.